There’s a reason we put glass in our buildings – it gives us a much desired and needed connection to the outside world and provides the natural light we crave. With this in mind, at SageGlass we work hard to create products that make that connection feel as seamless and natural as possible while maximizing daylight. That’s why this week, at the 2018 Glasstec International Trade Fair, we were excited to announce the launch of our newest, most elegant product offering to date – SageGlass Harmony™. Harmony joins our suite of dynamic glass products, including SageGlass® and SageGlass LightZone®, which enhance occupant comfort by preventing heat gain and glare while providing unobstructed outdoor views. Dynamic glazing tints to block heat and sun glare in buildings, but it’s not always necessary for an entire pane of glass to tint to create a comfortable environment. LightZone was our first dynamic glazing with in-pane tinting to control glare and heat, but with this product, occupants see defined lines between tinted and clear areas of the glass. Harmony, on the other hand, provides a more seamless approach by eliminating the defined lines between tint zones and replacing them with a gradual, natural in-pane tint transition from fully clear to fully tinted. Harmony offers the precise glare and daylight control of LightZone with a beautiful, seamless aesthetic. Harmony will be used in The Millennium, a smart building set to be completed in Crissier, Switzerland, in 2020. Millennium is motivated by a very bold goal: to empower its occupants by providing the best place to create, share and live their lives at work. 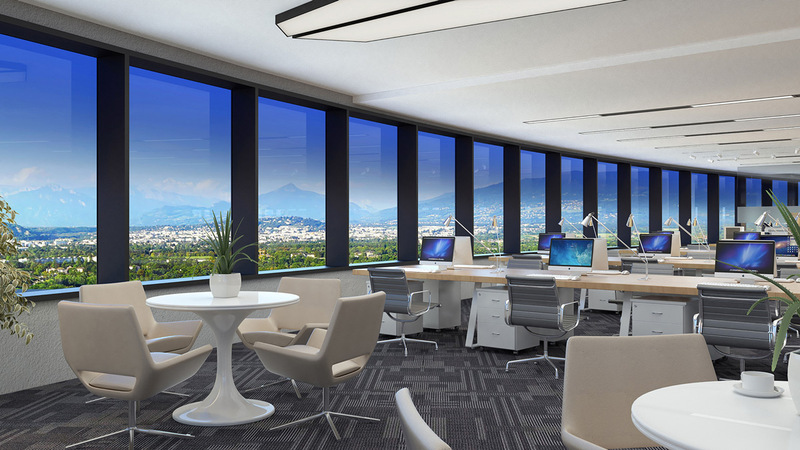 Recognizing that superior places demand ample access to natural light and views, Millennium provides all 1,500 workplaces with sweeping views of the Geneva lakeside across its curved glass façade. Millennium chose SageGlass Harmony to deliver the singular, innovative occupant experience that is at the heart of its mission. Every product selected for Millennium is an expression of the project team’s commitment to delivering only the very best. This was especially important for the glazing selection, since it is such a significant and visible part of the design. Harmony both embodies that commitment and will deliver to occupants an unparalleled level of comfort and connection to the outdoors. Delivering on its bold goal demands creating one of the most advanced, connected and tech-enabled working environments in the world. Everything at Millennium will be connected to the Cloud and managed via smartphone apps, from conference rooms to concierge services. In this smart building, the elevators will even know when you’ve entered the building and be ready to take you to your floor. The glazing needed to be just as smart. Harmony is integrated into Millennium’s Cloud service as an Internet of Things (IoT) device and is also driven by Siemens Building Management System, allowing the building to ensure it’s consistently delivering an optimized indoor environment for a superior occupant experience. Learn more about SageGlass Harmony and its unique benefits.